Menachem Begin was born in Brest­Litovsk in 1913. As a child he was forced to flee with his family to escape the fighting between the German and Russian armies in World War I. A passionate Zionist from an early age, he joined Ze'ev Jabotinsky's Betar youth movement in his teens, rising quickly to important administrative and leadership positions. By 1936 he was in charge of Betar Czechoslovakia, and in 1938 he became the head of Betar Poland, an organization with 100,000 members which engaged in weapons training to defend Polish Jewry, preparation and transport of “illegal” immigrants to Israel, agricultural training, and communications. In 1940, Begin was imprisoned in Siberian labor camps by Josef Stalin's NKVD (a forerunner of the KGB). After the Nazi invasion of the Soviet Union in 1941, he was set free by dint of his Polish citizenship, and joined the Free Polish Army, which in 1943 made its way to British­ controlled Palestine for training. Contacting the dormant Jewish underground, Irgun Zvai Leumi, Begin set about planning a Jewish uprising against the British authorities. This began in 1944, but increased in pace and scope immediately after World War II and continued until late 1947. Begin ordered many of the Irgun's operations, including the Akko prison breakout and the destruction of the central British administrative offices in the King David Hotel. Following the establishment of the State of Israel in 1948, Begin disbanded the Irgun. 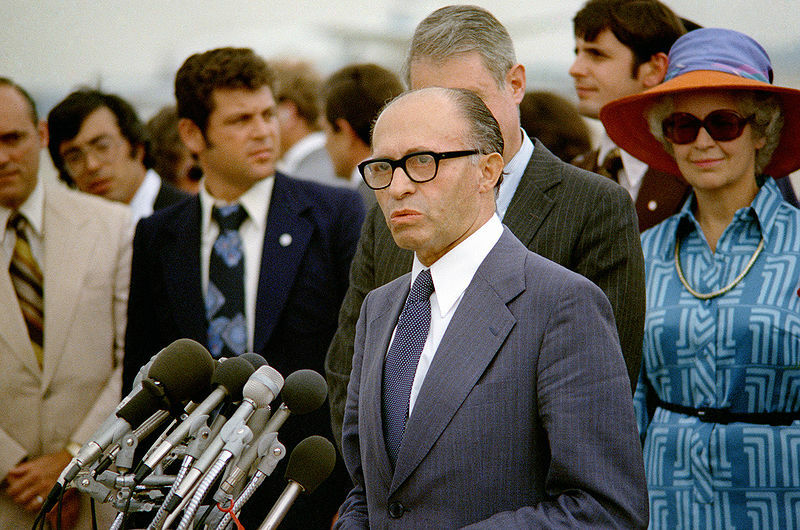 From 1948 to 1977, Menachem Begin was the leader of Israel's opposition. In the 1950's, he led the movement against accepting German reparations for the Nazi Holocaust. In 1965, Begin merged his Herut Party with the Liberals to form Gahal, which later served as the foundation of the Likud Party. The crisis atmosphere in 1967 saw the establishment of a National Unity Government, which finally brought Begin and other Gahal leaders to the Cabinet table. The National Unity Government continued until 1970, when Begin insisted that Israel condition Egyptian President Gamal Abdel Nasser's extension of the cease-fire across the Suez Canal on the signing of a peace treaty recognizing Israel. In 1977, Begin was elected Prime Minister of Israel. As the new head of state, he helped initiate the peace process with Egypt, which resulted in the Camp David Accords and the 1979 Israel-Egypt Peace Treaty. As of a result of this effort to achieve peace with Egypt, Begin was awarded the Nobel Peace Prize in October 1978 with Egyptian President Anwar Sadat. Begin invested national resources in development programs for Israel's poorer neighborhoods and sought to liberalize Israel's economy. In 1981, Begin ordered the Israeli Air Force to bomb the Osirak nuclear reactor in Iraq, where the Iraqi regime was developing nuclear weapons. Though Israel was roundly condemned by the international community at the time, it became apparent during the 1991 Gulf War that Israel's action had succeeded in hampering Baghdad's drive to acquire nuclear weapons. In 1982, after repeated acts of PLO terror, Israel launched Operation Peace for Galilee to remove the terrorist threat from Israel's northern border. Begin's decision to encourage Ethiopian Jews to immigrate to Israel later culminated in Operation Moses, which brought thousands en masse to Israel in the early 1980's. Following the death of his wife, Aliza, in the winter of 1982, Begin resigned as Prime Minister. He spent the rest of his life in seclusion, glimpsed in public only at memorials for his wife or at the weddings of his grandchildren. He died March 9, 1992, and was buried on the Mount of Olives in Jerusalem.